A traditional flan recipe is intensified with a splash of Rumchata, a rice based rum drink that adds great flavor to this vanilla caramel flan. Discovering that your chocolate-hating, dessert-despising husband loves caramel flan is the discovery of the century! When my husband and I visited my hometown of Santo Domingo, Dominican Republic, a distant memory flutters of him tasting flan for the first time and actually liking it. Fast forward to three years later and this Vanilla Rumchata Caramel Flan is made in my home. Normally, I don’t tend to offer him desserts because I know he’ll say no, but this time I had the courage to ask and he actually said yes. Imagine my surprise when my “I hate desserts, I’d rather seat a cheese plate” husband eats the entire slice of flan without looking back! Emotions ran through my head, thinking that I’d only be making flans of all flavors for the rest of my life if he’s willing to eat them. But enough of how much my husband hates desserts and loves flan. Let’s talk a little about how this caramel flan might just be one of the best flans you’ve ever tasted. My dad (yes, my dad!) gave me this recipe. He knows how to do two things in the kitchen: make flan and make cold-pressed juices; not a bad combination, but the fact that his flan recipe is pretty spot on makes me love him even more. I’m sure my mother had some play in this as well. 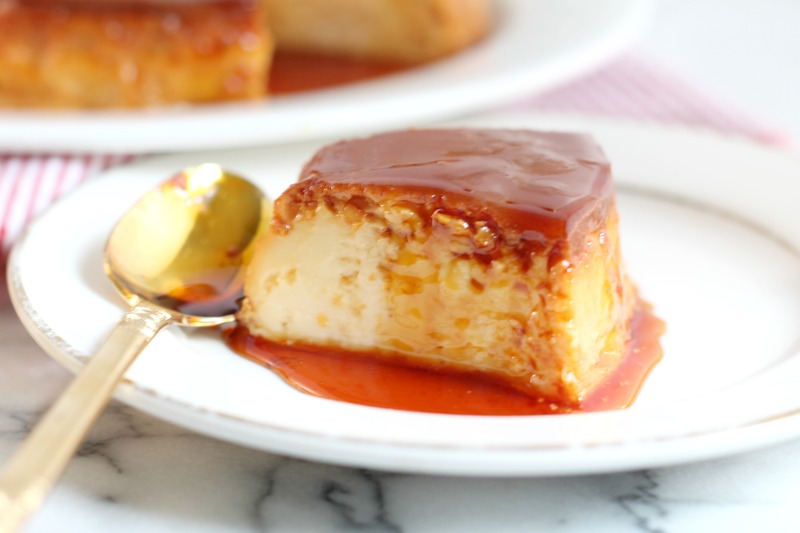 This flan is luscious, creamy, oh so rich with just a hint of rum from the Rumchata. If you’ve ever had horchata (a rice based drink) and you’ve had rum (an amazing Caribbean export) than Rumchata is the lovechild of both of these. The freshest cream from Wisconsin is mixed in, as well as their proprietary blend of spices. It’s seriously perfect for the holidays, as we’ve discovered that although it doesn’t need refrigeration, a small glass of Rumchata over ice is the perfect nightcap. A few tips on cooking flan, specifically on cooking times. Don’t overcook it! You might see it jiggle a bit, but after an hour, it’s probably done. I cooked mine a bit longer in fear that it’d be raw in the middle, and overcooked it a bit (see those bubbles in the flan – that’s overcooking it by just 15 minutes (I was watching Scandal, don’t blame me!) Touch the center of the flan at 45 minutes and you’ll get a sense of how it’s going. It’s a pretty easy recipe – and the results are magnificent. Note: Flan pans vary and the one I used was an old one handed down to me from my Dominican mother. I can’t find that specific pan online, as it is the pan and a double boiler pot method that cooks the flan on the stove pot. But any 8-9 inch round pan with at least 4 inches of depth can work with this recipe. Amazon sells some “flan pots” if you’re interested. 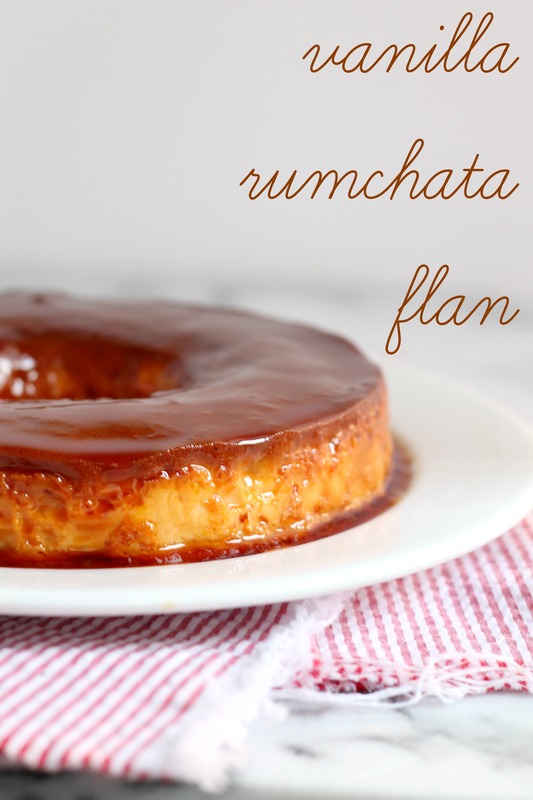 Are you ready for the recipe for this amazing Rumchata caramel flan?! Disclaimer: Rumchata sent me a couple of bottles – I had never tasted it before and honestly loved it, thinking adding it to flan would be a genius idea. It worked! But I’m not paid to say that, nor was I under any obligation. This recipe is totally delicious!! Just wondering as we often bring it to a family gathering can it be doubled? It would need to be made into two separate pans, but yes! Would you believe I’ve never even eaten flan? I know, I know… but Rumchata? I know plenty about that! YUM! Marnely, this looks so good. I love flan. My mom used to make it when I was growing up and I’ve somehow never mastered the technique. Yours looks easy. If I don’t want to use Rumchata what can I use it its place? Just plain old rum? Thanks much!